The amazing bubble ball is like no other ball you've ever played with before! It looks like a bubble, moves like a bubble, but you play with it like a ball! You can kick it, whack it, throw it, bounce it and even sit on it! Designed for unlimited hours of fun in the moon-bounce jumping castle, ensuring 100% safety for any event. Included Inflatable, Blower, Stakes, Storage Bag, Repair Kit, Operation Manual. Bounce House. INCLUDES 450 WATT BLOWER: Premium-quality 450 watt UL-Listed bounce house blower will keep your bouncer springy. Features a covered on/off switch and grounded power cord for safety. Caution: Always use GCFI-protected receptacles/circuits and take caution to keep blower and power cords in dry locations. The charming Mini Crayon design has been carefully crafted to ensure safety. 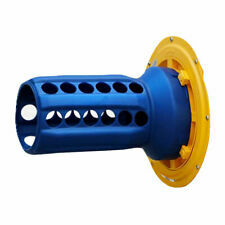 INCLUDES 480 WATT UL-LISTED BLOWER: Includes a premium-quality UL-Listed bounce house blower with a 480 Watt. 7 horsepower constant output to keep your bouncer springy. Made from top-secret Super-Thermo Stretch-tacular stuff, Balls are squishy, super-soft and lightweight. 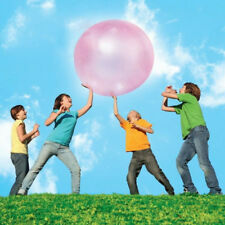 The amazing bubble ball is like no other ball you've ever played with before! It looks like a bubble, moves like a bubble, but you play with it like a ball! It's always nice to have a backup unit. This 8' long and 2' deep vinyl pool is designed to attach with our Pogo Inflatable Bounce House Slide Crossover Combo. The pool is very easy to install in minute. Watch our instruction video below for reference. Inflatable Animal Print Bounce Jump House. 1 x Inflatable Castle. Easy and quick to blow up. Stitching: Double & quadruple stitched for extra strength. 4 x Ground Stake. Easy to setup & take down; instructions included. INCLUDES 480 WATT UL-LISTED BLOWER: Includes a premium-quality UL-Listed bounce house blower with a 480 watt, 0.7 horsepower constant output to keep your bouncer springy. Features a covered on/off switch and grounded power cord for safety. Made by heavy-duty puncture proof 420D Oxford materials, it is extraordinarily durable to bring much happiness to your children. Easy to set up & take down, it can be blown up quickly. You can carry this bounce house conveniently to anywhere by a durable carrying bag without the restrict ion of location for your children to enjoy the fun! In this charming rocket castle, kids can bounce, play basketball and slide. Most of all, the bounce house is super easy to set up. There is also one oxford carrying bag included for conveniently storge. The official store of ToysRUs on eBay CA! Inflatable Dual Lane Pink Blue Dry Slide Bounce House Combo With Blower. Type Inflatable bounce house slide combo. Bounce House Combo. Includes : Inflatable units, Storage bag, Blower, Anchoring stakes, Repair kit and Safety Signs. Standing at 12 feet tall and 21 feet long of water sliding bliss, this is sure to be an absolute hit for kids of all ages! These slides can even be used without water for just as much fun. Kids Rainbow Wet/Dry Inflatable Water Slide Single Lane Moonwalk. An inflatable bouncer offers fun and excitement for any event. It can be set up at a birthday party, school function, or special event with friends and family. There is a variety of sizes to choose from that will suit the ages of the people using the bounce house and where it will be placed. An inflatable bounce house is a structure that has air constantly flowing through it so that it will maintain its shape for people to jump or slide on, depending on the type of inflatable. Some inflatable houses look like castles or animals, while others feature a combination of a bounce house and a water slide. How can you play on a bounce house? 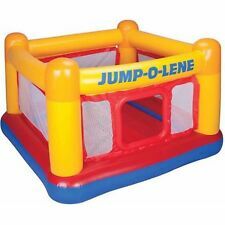 Jumping: The basic function of a moonwalk house or a standard commercial bounce house is to allow space to jump. Running in an obstacle course: Run through an obstacle course that features slides, balls in a pit, or hanging objects to get around. Running and bumping: Some inflatable objects look like balls that you stand in while running around. You can hit other people while wearing the inflatable. Are there other types of houses instead of a moonwalk? There are several types of inflatable houses. Some have a slide on the side that you can add water to or leave dry. A small bouncer castle sometimes features designs that are attractive to younger children, such as a bear or elephant, and they aren't as tall as a standard bounce house. You can usually find a bounce house that is in the shape of a circle, similar to what a pool looks like. 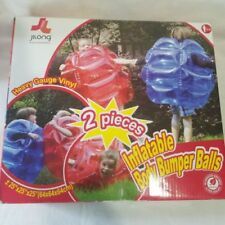 Small plastic balls can be put in this type of inflatable for children to play with. Other types of inflatables include costumes, jungle jumpers, and houses that feature well-known cartoon and movie characters. What is the age limit for bounce houses? The age limit for an inflatable bouncer usually depends on its size. A small inflatable would be appropriate for a toddler but not an older child due to how small the inflatable is. 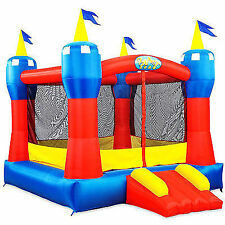 Most larger bounce houses, such as a moonwalk or a castle, are suitable for children of any age as well as adults. 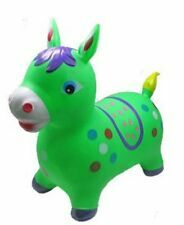 With such a large variety of inflatables, youre sure to find something just right for your event.